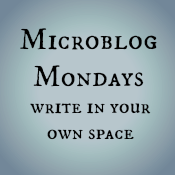 This short post packs a lot of punch! It's so true, we go through the hard stuff because we have to, and we come out of it a stronger person. There have been so many times when I've felt like the weakest person on the face of the earth (dramatic, I know, but when we're in the depths of it, that's how it feels), but now I can look back and say with confidence that I was actually pretty damn strong. You are so right though, we have to work through the hard stuff and know that we're going to come out of it better. A timely and strong post! Oh, I love this! Resilience is totally working through the pain, and figuring out how to still be a functional human-like substance (and then eventually reconstituted into a normal human with scars). Just because you cry or feel rage or hopelessness doesn't mean you're not strong. It's that whole getting up after getting knocked down...it just may take a little while longer if you're hit with a wallop. Wow, just wow. 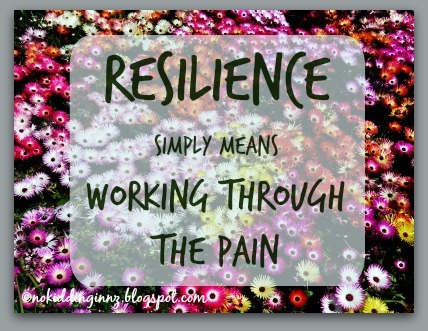 I love this post, and love your definition of resilience. I too "flew blind" for a while, trying to figure out what to do, but during that time I was becoming stronger (though I didn't realize it and thought I was weak). What an important message you're bringing for those still in the midst of the fight. I loved jjiraffe's post. I agree that so many times it's about moving through that difficult time, putting one foot in front of the other way any way that you can. Great post! For some reason I feel I have seen a bunch of articles lately about the damaging effects of loss, trauma, bullying or abuse. Yes, it is important to recognize and validate the physical, emotional, social and spiritual harm. However, I feel it paints a bleak future to remain focused on the impacts as if the person is damaged for life, or damaged goods. 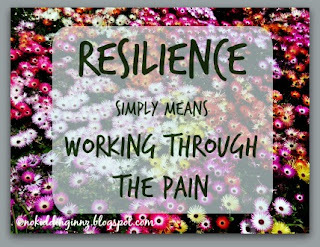 Resiliency is so important in healing, grieving and reclaiming your personal power. It may take time, but you can move through those experiences to a beautiful life. Thank you for the link to the article.